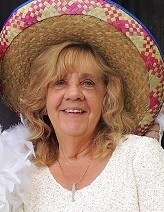 KATHY LYNN ROBINSON, age 62, of Washington CH, passed away on Thursday, April 4, 2019 at 1:26 p.m. at her home. She was born on June 17, 1956 in Fayette County to Carl and Barbara Lowe Saxton. She was a 1974 graduate of Washington High School and also attended Southern State Community College. Kathy retired from the City of Washington Clerk of Courts after twenty-five years of service. She enjoyed traveling, going to games, and was an avid Ohio State Buckeye Fan. Kathy was preceded in death by her parents; and her loving husband, Michael A. Robinson, whom she married on February 19, 1977. Survivors include her daughter and son-in-law, Brooke and Courtney Cribbs; granddaughters, Kennedy Cribbs, and Kelsey Cribbs, of Mt. Pleasant, South Carolina; sister, Tammy Radvanyi of Lancaster; aunt, Mary Kinzer; special friends, Kevin and Lenora Smith, Carrie Smith, and Devin and Erin Smith; her traveling buddy, Connie Watson; and her boyfriend, Darren Barker. Also surviving is a host of other family and friends. The funeral service will be held on Tuesday, April 9, 2019 at 1:00 p.m. at the Summers Funeral Home with Danny Dodds officiating with burial to follow at the Highlawn Cemetery. Family and friends may visit at the funeral home on Tuesday morning from 11:00 a.m. until the time of service.